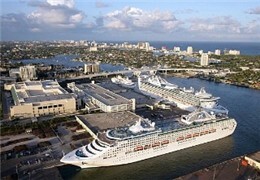 As the third busiest cruise port in the world, Port Everglades has teamed up with the Greater Fort Lauderdale Convention & Visitors Bureau (GFLCVB) to entice cruisers to stay overnight in South Florida. New marketing initiatives are designed to encourage pre- and post- cruise stays. The images displayed showcase area beaches, outdoor activities and yachting. In addition, travelers may pick up pamphlets at new terminal "brochure stations." Located within South Florida, Port Everglades is "Cruise Central" -- with hundreds of cruise ship embarkations annually and a huge plethora of port calls by lines from around the world. Best of all, the port is just around the corner from pristine beaches; eclectic attractions; and dining, shopping and entertainment fun. The Everglades "sea of grass" is just a half-hour to 45 minutes away by car. 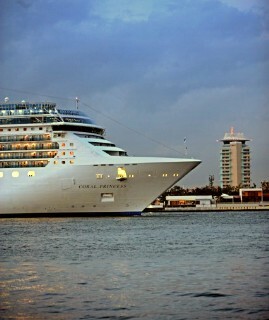 Freelance writer and copy editor Lizz Dinnigan looks at this popular South Florida port. She gives a snapshot look at the port, its facilities and services, its future plans and what's to see and do for cruisers. 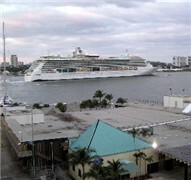 Come along with Lizz for a visit to Port Everglades. A new training program for porters at Port Everglades is designed to assure cruise guests receive the most helpful services when they interact with porters handling their bags. 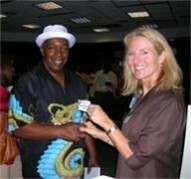 The SUNsatiional program is the product of cooperation by multiple south Florida tourism, port and labor organizations. Porters who "graduate" receive a special pin that identifies them to cruise guests. Read more about this innovative effort. Sure, cruisers who book a pre- or post-cruise stay in conjunction with a Port Everglades cruise have plenty of high-priced theme park or attraction options in the Sunshine State. But what's a family or a couple on a budget to do if they're seeking fun at a lesser economic outlay? Our freelance writer Marcia Levin, a Hollywood, FL resident, takes a look at what's available for cruisers on a pre- or post-cruise visit to Broward County (basically Greater Fort Lauderdale). She's come up with a Top 10 list for cruise vacationers who want to see the area but at an affordable cost. From alligator spotting to boardwalk hopping, Marcia's on top of the best activities for visitors. Let's check them out.